In partnership with CEATEC Japan, the U.S. Department of Commerce, is pleased to offer U.S. companies the opportunity join the U.S. Pavilion at CEATEC Japan and providing U.S. export assistance at CEATEC 2018 as part of the Trade Fair Certification program. CEATEC JAPAN 2018 is the international exhibition and business forum for Cyber-Physical Systems (CPS) and the Internet of Things (IoT). The consolidated event brings together around 145,000 people from business leaders, to engineers & researchers from different industries. 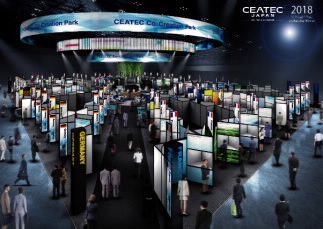 The 4 main areas of CEATEC Japan include the Community Area, Devices & Software, Home & Lifestyle, and the Themed Area. Pitch – access to the “pitch” area that accommodates an audience of about 30 (investors, media, industry reps, etc.) for presentations, Q&A sessions, etc.